Swisspers market-leading premium cotton tips now with a paper stem. 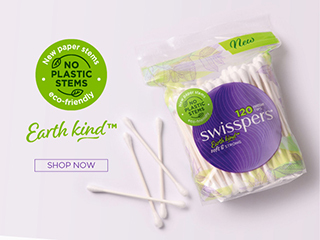 Swisspers Cotton Tips are made from 100% cotton and sustainably sourced paper stems. In addition to cleaning the outer ear, they are ideal for precision application and touch-ups of make-up. The stiff paper stem gives you greater control compared to a standard plastic stem - plus switching to paper stems reduces single-use plastics in our environment. The re-sealable plastic bag uses 90% less plastic than a conventional tub and can be recycled at a RedCycle soft plastics collection points. Paper stems are made from sustainably grown wood pulp and recycled paper, with 100% cotton tips. The resealable plastic bag is made from LDPE and can be recycled at a RedCycle soft plastics collection point. DO NOT INSERT COTTON TIP INTO EAR CANAL, IT CAN CAUSE SERIOUS DAMAGE TO THE EAR DRUM.